Yeah, I'm sure it is offensive. But I can deal with your ire. There was an interesting NPR story a long time ago talking about crucifixions and how people died. It wasn't really from the nails, obviously - I mean, lockjaw is a slow slow slow way to die. Though I suppose one could get infection. But no, they discussed how the shoulders would have pulled from their sockets as people's body weight drooped and hung. That death would most likely have come from dehydration more than blood loss. At least I can get on board with that - so to speak. Ah - 'on board'. I just got my own joke. Boards. I guess. Plural. My friend, Jeremy, sent me this next no-no. Well, no-no for most people. Not for Jeremy. And not for me. He knows me too too well. I'm fine being "that guy". 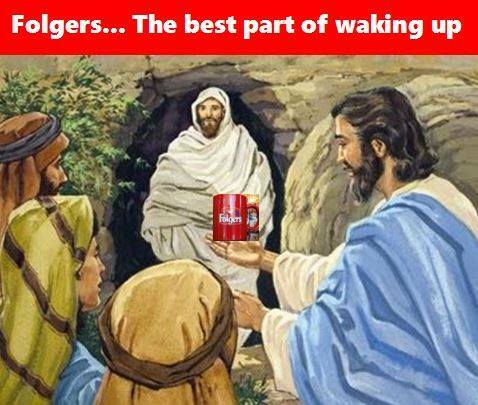 Still, if you celebrate, have a nice Easter. bwhahahaha! not religious and don't celebrate in this house. however, we DO have chocolate covered eggs! Happy find the brightly colored eggs that the bunny laid day! 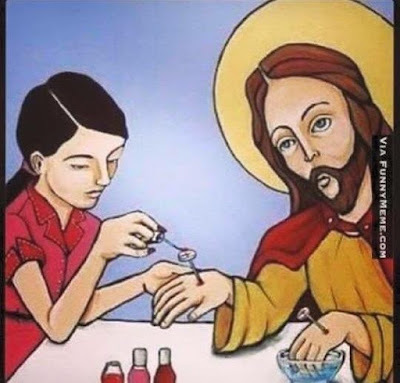 Sadly, only Jesus Getting His Nails Done loaded ... but that was enough for me! And... the guitar solo gif has me LOLing! And a belated zombie jesus day to you!